Read the full article here: Why do people think mutual funds are a good idea? Learn how to analyze a company using both fundamental and technical analysis for a listed equity stock in financial markets. Using #StockEdge (download free - https://goo.gl/bjfD8V) you can study any script to analyze historical financial data as well as technical charts. 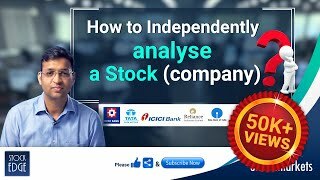 Must watch till the end to learn to analyze stocks independently. Peer group comparison or an industry-wise comparison using different parameters and ratios like market capitalization, Earning Per Share, Price Earning or PE Ratio, liquidity ratio, profitability ratios. Also one can find out the trailing EPS vis a vis the annual EPS. 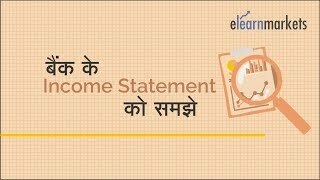 Check quarterly results and check profit and loss account, cash flow statement and balance sheet in easy to understand visual representation. Compare items like Depreciation, Interest, PBT etc. Ratio analysis is also available for instance growth ratios, efficiency ratios, solvency, cash flow ratios, valuation ratios. Also, you can read annual reports and listed to con-calls, check shareholding pattern, the names of people in the Board of Directors. Whether you are an experienced market professional or a student, to learn financial markets register on https://www.elearnmarkets.com for FREE. The Commodity Channel Index (CCI) Oscillator helps us to find out cyclical trends in security. Find out stocks based on CCI oscillator using StockEdge application. The CCI is used to identify trends not only in commodities but also in stocks and currencies. Traders and Investors use CCI to identify price reversals, price extremes, and trend strength. It has a range from +100 to -100. The area above +100 is an overbought region, the area between +100 and -100 is a normal region and the area below -100 is oversold region. The '0' (zero) line is the marker between the bull and bear territory. In a deep correction, the CCI of a stock would go below -100 and now if a bullish correction takes place, the CCI of a stock would go above -100 and if the bullishness increases the CCI of the stock would go above 0 (zero) and if the bullishness momentum continues the CCI would eventually go above +100. If a bearish reversal takes place the CCI moves below +100, then 0 (zero) and then -100. Use StockEdge application to find out stocks which are showing Bullish or Bearish signal in CCI indicator. 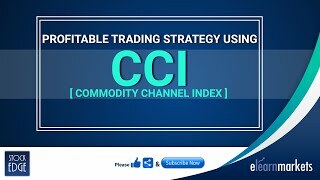 Watch this video on how to use CCI Indicator in StockEdge app. You can also buy StockEdge Basic Membership and get access to an advanced feature of StockEdge app. We went live today 22.01.19 with Finance experts Siddhartha Goenka, Smita Mohta and Vineet Patawari. 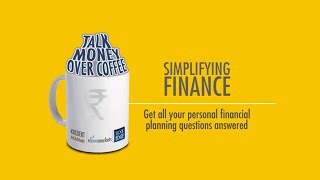 The Live was specifically done to solve personal financial queries. 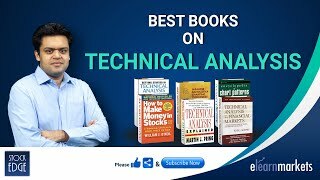 Best Books on Technical Analysis- Get to know them all in this video! Technical analysis focuses on the study of price charts and trading history to determine future price movements. It focuses on charts and specific indicators to identify consistent trade patterns in the movement of stocks and indices. While it is difficult to know all about technicals, the following books can serve as a good starting point for enhancing your skills in technical analysis. Read on to become an expert! 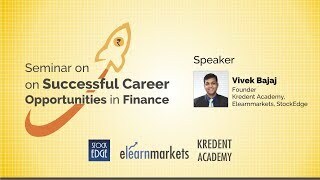 If you are looking for a career in Finance then listen to expert market professional Vivek Bajaj Founder - Kredent Academy, Elearnmarkets & StockEdge where he is explaining the different careers you can opt for in the field of Finance. Know about the scope or career opportunities in the field of data science, analytics, actuarial sciences and much more. 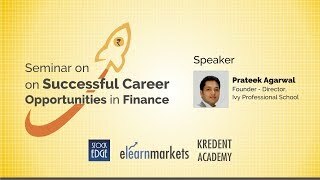 https://www.elearnmarkets.com organized a seminar on career opportunities in finance. To get various career options as financial professional, you need to choose the right educational qualifications. Speaker Anurag Singhal explains various qualifications in the field of finance and the career opportunities you can get after completing your education. He has very nicely covered degrees like Chartered Accountancy (CS), Company Secretary (CS), Chartered Financial Analyst (CFA), CPA, CIMA, etc. Anurag Singhal CA, MBA (IIM Ahmedabad) and 10 years in corporate explaining the various career opportunities in Finance. How does Inflation impacts in the Economy? The variables which are influenced by inflation are interest rate, exchange rate exports, imports and unemployment. However, the biggest influence is inflation on interest rates. In situations of high inflation interest rate is raised to control inflation and vice-versa. Inflation directly effects exchange rate by reducing the value of currency. It indirectly effects it through interest rates. There is an inverse relationship between inflation and unemployment given by the Phillips Curve.High economic activity leads to more demand more jobs and hence higher inflation. The effect of inflation is not well-established on exports. Inflation makes imports more expensive through depreciation of home currency. What is Buyback of Shares and How does it works? Buy-back of shares is an investment instrument by which a company buys its own shares from the existing shareholders. This can be carried out in two different ways: Proportionate Basis and Book-Building process. In the first method; the company buys back its shares from the existing shareholders on a proportionate basis via offer. While in the second method they buys back through the stock-exchange. There are a number of guidelines associated with this process. It leads to a fall in the number of outstanding shares, a rise in EPS and an increase in the market price of the shares. It is used to eliminate threats, delisting and converting extra cash. Read the full article here: Why Buyback of Shares is done? A stock market is a place where forces of demand and supply operate and where the investors interact to trade shares. There are two different types of stock market-over-the-counter and exchanges. In India the most popular stock exchanges are NSE and BSE. One of the important terminology with respect to stock exchange is Market Capitalization. It can be defined as the product of number of outstanding shares and the market price. On the basis of this; companies can be divided in small-cap, mid-cap and large-cap. Free-Float Capitalization is a product of number of free-float shares and market price of shares. And is used to calculate Sensex and NIFTY. 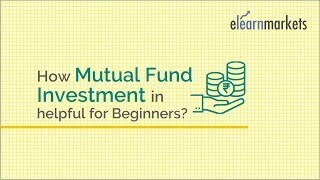 How Mutual Fund Investment helpful for Beginners? A mutual fund is common investment vehicle that pools the funds from a group of investors and then invest the collected fund into different asset classes.Some common asset classes are stocks,,bonds commodities ,etc.The features that attract investors to mutual fund investments are: risk diversification, quicker decision making,professional management and so on .There are two different types of mutual fund schemes - Open-ended scheme and Close-Ended Scheme.One should closely read the offer document of the mutual fund before investing in a mutual fund. 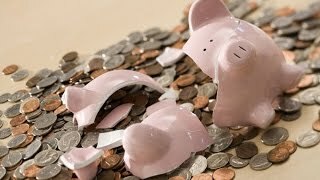 There are a number of steps involved in a successful financial plan such as developing an emergency fund taking care of the health expenditure , education retirement, and many more.However sometimes a new investor may make a series of mistakes while undertaking investments.Some of the common financial mistakes are inadequate investment planning,non-diversification,dependence on historical market trends and so on. IPO Process , Several steps are involved which is essential before listing its securities. Lets go through these steps in brief.The first step involves hiring of an underwriter or an investor banker, known as book running lead manager (BRLM) who shall go through the financials of the company, and takes the lead in the entire process of fund raising. BRLM prepares a Draft Red Herring Prospectus (DRHP) and submits it to SEBI for approval.After receiving SEBI clearance on the public issue and approval from stock exchanges, BRLM begins distribution of IPO Application Forms through its designated Syndicate Managers.The initial public issue is open for a certain number of days and the bids are updated with the stock exchanges as they are received.Then the Registrar does the fair distribution of shares.The allocated shares are now deposited into the demat accounts of the investors and get listed on the designated stock exchanges on the specified IPO Listing Date. Primary markets are where stocks are created whereas secondary markets are where stocks are traded. When a company decides to go public for the first time by raising an IPO, it’s done in the primary markets. The company sells to the investors directly. After the shares are bought for the 1st time in the primary markets, they are then bought and sold amongst different traders/investors in the secondary markets. The issuing company is not involved in the share trading. Know about the Chartered Accountancy Course. 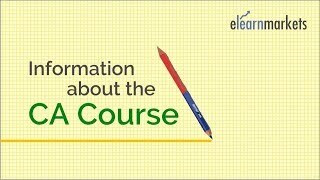 Get an insight to the CA curriculum like the 3 levels CPT, IPCC, CA Final and the training program by watching this video. 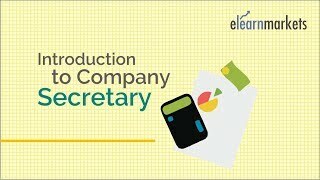 Introduction to Company Secretary Course - How to purse? The Company secretary course enables the candidate to be responsible for the efficient administration of the company. Watch the video to know more! Introduction to Chartered Financial Analyst (CFA) - How to pursue? Ever wondered if you should pursue the Chartered Financial Analyst (CFA) course? To decide, Read the full article here: Which course to opt for- MBA or CFA? 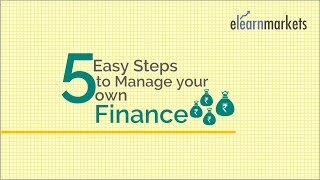 Simple steps to manage your own personal finance. Steps includes are Create an emergency fund, Buy term insurance, Buy Mediclaim, Divide your personal finance goal, Retirement planning etc. Read the full article here: How to become your own financial planner?